I got into a tycoon-style game kick recently and went searching for games to fill that need like Roller Coaster Tycoon does for me. I had seen some content about Megaquarium before, so I decided to give this aquarium builder a go. This post contains affiliate links. Purchasing the game with my link will give me a commission and donates to charity. 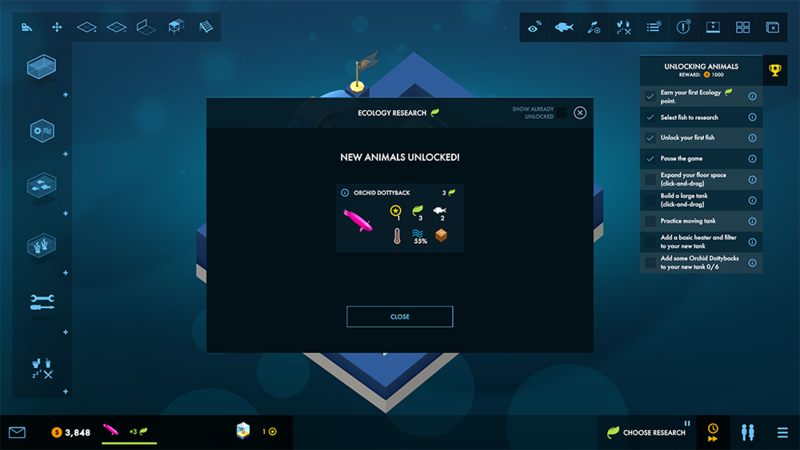 Megaquarium has two options: a campaign mode and a sandbox mode. I started with the campaign mode to get a tutorial and get a feel for the game. While the very start of the game felt counterintuitive from other games in its genre for me, it’s tutorial does a good job helping you get used to it while actually playing the game. While building your aquarium, you are collecting resources to put towards unlocking new species and items like new tanks and equipment. These resources are earned through your guests viewing different species in tanks, and different fish and creatures give different resources. This is not just putting fish in a tank and calling it a day. The tanks have to be properly set up for the occupants. That means using heaters, filters, coolers, or other various pieces of equipment. This also means having different foods available for the fish and enough staff to take care of everything. And with the campaign mode, you have to meet various objectives to level up and move on to new aquariums. Besides the campaign mode, there is sandbox mode, which is easily my favorite. While I did enjoy the structure and objective completing of the campaign, I really just wanted to make a cool aquarium. So off into sandbox I went, and oh is it so much fun if you love the building aspect of tycoon games. What was nice about setting up the sandbox is I had a lot of control of what I had access too, how difficult it was, if I would have side objectives, and similar settings. That amount of control is awesome. I learned very quickly that when you up your level significantly without playing the campaign up to that point, you can get thrown some scenarios and animal needs you weren’t anticipating. And that’s on me, and really how the game should work. But I adapted quickly and have sunk many hours on end into the sandbox. I have nothing but positive things to say about this game. It’s beautifully designed, the UI is clear and easy to learn, the mechanics are explained well, it runs smoothly, and has been a lot of fun to play. It’s clear the devs really cared about this game when making it. I have easily spent multiple hours in one spot just playing this game because I enjoy it so much. It also really filled that need for a simulation-building-tycoon game like Roller Coaster Tycoon. Have you had a game exceed your expectations when you played it? Let me know what game with a comment! I got to play a very early build of this at EGX Rezzed one year, it was really fun and I’m glad to see it’s developed in to a good game. Aweeee this game looks so cute!!!!!!!!!!!!!!!!!!!! I need it in my life! Feeling like I might just have to add this to my wishlist. I LOVE Roller Coast Tycoon and I LOVE aquariums so this is a sweet spot that I can’t pass up checking out. “Megaquarium” looks like a nice video game. I also enjoy “Roller Coaster Tycoon” and titles in which you can build your own environments. I think I might try this one soon.